The dauer life stage in wild-type C. elegans exhibits morphological and behavioral characteristics that differentiate it from non-dauers (Hu, 2007). In addition to the commonly observed radial shrinkage, quiescence and lack of pharyngeal pumping, we noted a tendency of wild-type dauers to lie dorsoventrally when mounted on agarose slides, as opposed to laterally like adults. To quantify this observation, we mounted wild-type dauers and L3s on increasing concentrations of agarose with 0.1 M levamisole. We found that 75-90% of wild-type dauers mounted with levamisole lie dorsoventrally regardless of agarose concentration (Fig. 1). Very few (2.5-5%) non-dauer animals were positioned dorsoventrally. There was no significant difference in positioning between dauers that still retained their L2d cuticle and those that were unsheathed. We then utilized a non-anesthetic method of immobilization by mounting dauers on 10% agarose with 10 micron polystyrene microbeads (Kim et al., 2013). Interestingly, only 15% of wild type dauers lie dorsoventrally when mounted using the microbeads. We hypothesized that the radial shrinkage and the presence of lateral alae in wild-type dauer cuticles may cause anesthetized dauers to roll to a dorsoventral position, but that “conscious” dauers immobilized with microbeads would remain lateral, despite the presence of alae. To test this, we examined dex-1 mutant dauers. We recently found that dex-1(ns42) dauers are defective for dauer alae formation and radial constriction leading to a dumpy dauer phenotype. We found that dex-1 dauers are significantly more likely to lay laterally than wild-type dauers (p=0.0013) (Fig. 1) suggesting that dauer alae or overall body dimensions regulate the anesthetized “sleeping” position. 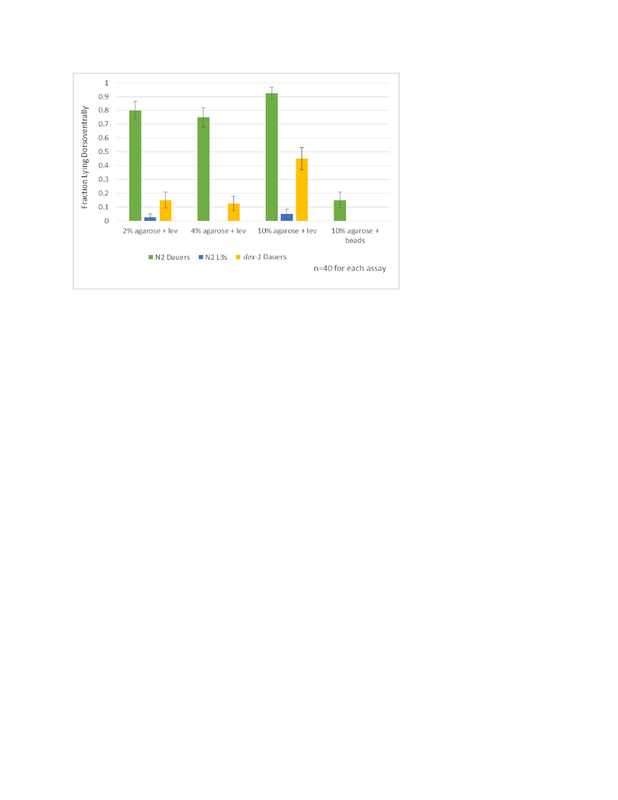 Figure 1: This chart illustrates the difference in percentage of N2 dauers, N2 L3s and dex-1 dauers lying dorsoventrally across slide methods with increasing concentrations of agarose using levamisole (lev) and 10% agarose using polystyrene microbeads (beads). The N2 dauers consistently (75-90%) lay dorsoventrally, while 2-5% of non dauer animals lay dorsoventrally. N2 dauers lay dorsoventrally significantly more than dex-1 dauers (p=.0013). Kim E, Sun L, Gabel CV, Fang-Yen C (2013) Long-Term Imaging of Caenorhabditis elegans Using Nanoparticle-Mediated Immobilization. PLoS ONE 8(1): e53419.